Crown Dorset vase - 3" (76 mm) high. 1920s. In 1905 Charles Collard bought two houses, 21 and 23 Green Road, Poole, Dorset, and converted them into a pottery. Collard had been an apprentice at Aller Vale Pottery, and brought their ideas to Poole, which in many ways resembled Torquay - it was a holiday resort on the South coast of England with good supplies of local red clay. The Crown Dorset Art Pottery made souvenir wares in very similar styles to those being produced in South Devon. Indeed, some of the early designs were identical, but it did not take Collard long to develop his own patterns. He employed male decorators, mostly young, to paint the designs and scratch the sgraffito mottos on the pots, but as the century reached its second decade and the pottery had become established with a good reputation he started to employ female decorators too. By 1915 the First World War was having the same effect on the the company that it had on all other potteries. Collard, who was not in good health, sold 'Charles Collard and Co' to George Paine. 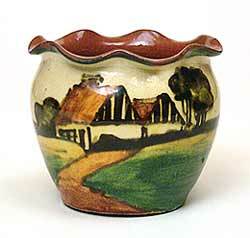 Late in 1917 the company was dissolved and following year Collard left to set up the Honiton Pottery in Devon. Paine continued and the pottery reached its period of highest output in the mid-1920s. From then, though, it declined, having suffered badly from a serious fire in 1925, and eventually it closed in 1937.